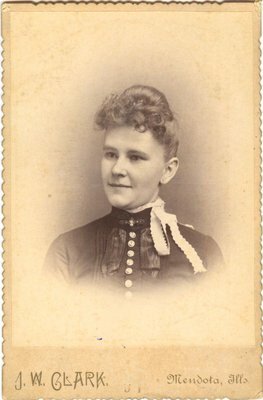 A photograph of Christina Wilson from the photo album belonging to Margaret McCague Wright and her husband William Ashford Wright. J. W. Clark was born in Lewisburg, Pennsylvania, in 1852. His family moved to Mendota, Illinois, in 1854. J. W. learned the art of photography, and in 1881 succeeded J. L. Gurrard in business. (See: History of La Salle County, Illinois: Together with Sketches of its Cities, Villages, and Towns. Vol. 1, Chicago, 1886, p. 689).